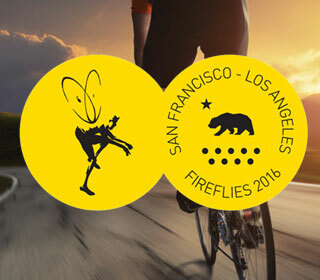 For the ninth year in a row, the Fireflies West take the coast of California and tear up the miles in benefit of leukemia research at City of Hope. Fireflies West will depart San Francisco on September 23, and arrive into Los Angeles on September 28. It's six days and 550 miles of cycling down some of the most beautiful coastline in the world. We've reached 87% of our $450,000 goal! Join us and support the Fireflies as we cycle 550 miles to raise money for The City of Hope to aid research in blood cancers.